This was our second lifer in front of Romy Ocon's house! The first one was the Ferruginous Flycatcher just a few weeks previous to this. This is an uncommon bird that is usually found in the forest, forest edge, open scrub, and early second growth. This individual was in a residential subdivision in BF, Parañaque. There is also another individual that frequents the UP Diliman campus hunting for bats in the late afternoon. We went there several times to try to see it, but had no luck. And then this one turns up just a few minutes drive from our house! We photographed this bird in the morning. It was resting in the tree. 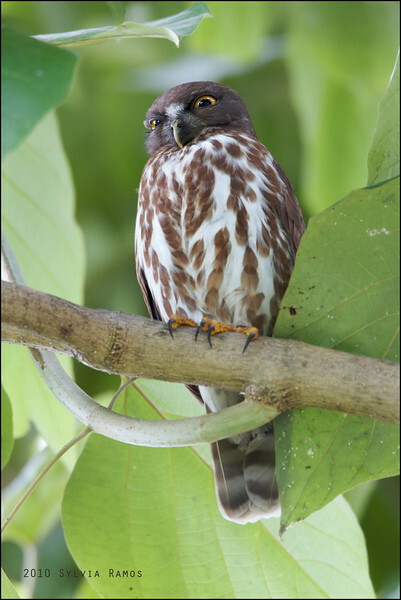 There are resident and migrant populations of Brown Hawk-Owls in the Philippines.